Does the idea of 'raw food' conjure images of cows chewing the cud, or rabbits nibbling on lettuce? I have to admit, I too was guilty of harbouring misconceptions about raw food until a couple of years ago. I thought it meant just smoothies (which I do love, but not all the time) and boring salads. I didn't realise the world of raw food could be so creative and flavourful until I experienced raw tacos at a restaurant in Portland, Oregon, a couple of years ago. Now, I'm certainly no raw foodie (as you can tell from the recipes on my blog, I LOVE cooking), but whenever I give a raw recipe a try these days, I am always pleasantly surprised. And even more so when it is very simple to create. I don't have equipment like a dehydrator (so anything involving one puts me off), not even a spiralizer, which is exactly why Rebecca Kane's Shine Inside and Out book is brilliant. There's nothing complicated in it at all, so how fab Rebecca has offered to give a copy away to one of my readers?! Win A Copy of 'Vegan Food Gifts' by Joni Marie Newman! This Christmas just gone, I had been in receipt of the wonderful new book 'Vegan Food Gifts' by the even more wonderful Joni Marie Newman, who is author of the famous veggie burger bible, The Best Veggie Burgers on the Planet. This meant that many of my loved ones got given hand-made jars of all things nice and vegan from me this year, thanks to some of the ideas in the book. I was very excited about the arrival of Vegan Food Gifts. It was full of intriguing and creative ways to make unique gifts that are so much better than anything you can buy in the shops. I was most interested in making up jars from the 'Just Add Water' section - I did the Fudgy Brownie Mix, the Spicy Taco Mix, and a couple of others. My recipients seemed to be very pleased with their gifts! This month and the first of 2013, I have a fab giveaway on offer which is vegan author Joni Marie Newman's new book, 'Vegan Food Gifts'. If you take a peek at her website too, you'll see the many other wonderful books she has written. In this interview, I thought my readers would be fascinated to hear more about how Joni got published, why and how she went vegan, and how much she loves vegan junk food! Joni is definitely an inspiration. I had been a half-assed off and on vegetarian since high school (I am now 37 years old) and was always fascinated by vegetarians, animal rights activists, and vegans. When I was in the tenth grade my friend, Kayt, and I did a very graphic presentation in our English class about animal testing and vivisection. Complete with a 'zine handout and "Meat is Murder" as the soundtrack in the background. I've probably owned the desserts-to-die-for bible of Vegan Pie in the Sky long enough now, and baked enough of its treasure chest of goodies, to be able to provide a decent review and tell you what I think. I have a small collection of vegan cookery books by Isa Chandra Moskowitz and Terry Hope Romero, who seem to have cornered the vegan market with their many amazing recipes, and I bought this book after trying a couple of recipes from their website. The first was the Pumpkin Cheesecake with Pecan Crunch Topping. Utterly amazing. I actually made this for two American friends around Thanksgiving time last year. Both were heartily comforted by its taste of the USA in the pumpkin element (even though I have to admit, I actually substituted with butternut squash! ), and were extremely impressed with what I'd managed to create. "What happens to all of the male offspring of layers? If man hasn't designed them for meat, and nature clearly hasn't designed them to lay eggs, what function do they serve? They serve no function. Which is why all male layers — half of all the layer chickens born in the United States, more than 250 million chicks a year — are destroyed. Destroyed? That seems like a word worth knowing more about. Most male layers are destroyed by being sucked through a series of pipes onto an electrified plate. Other layer chicks are destroyed in other ways, and it's impossible to call those animals more or less fortunate. Some are tossed into large plastic containers. The weak are trampled to the bottom, where they suffocate slowly. The strong suffocate slowly at the top. Others are sent fully conscious through macerators (picture a wood chipper filled with chicks)." If you follow this blog, you'll probably know that I've gone from being vegetarian (most of my life) to eating some meat (blinkered period), to being vegetarian again (principles couldn't stay down) but trying to cut out dairy (Conklin Farms horror), to being pescitarian but only choosing MSC fish (it suffers marginally less) and now? Well I've gone and bought myself Jonathan Safran Foer's book 'Eating Animals', and I'm really starting to think the fish - and even the prawns - have to go. I've cut down immensely on eating fish, I have to say, and I have been working at eliminating fish from my diet completely. But I never really saw any reason to give up prawns, ever, on the basis that I didn't think they suffered (which might not be true anyhow), as well as the fact that when there's nothing else on the menu that's veggie, there's usually a prawn dish I can eat. Yet I hadn't really considered the environmental impact of my prawn habit. In Eating Animals, Safran Foer says that "shrimp trawling devastates sea horse populations more than any other activity". Sea horses are actually quite marvellous little creatures, with very complex natures (they live in long-term monogamous relationships and the males become pregnant, for crying out loud! ), and they are being wiped out by the fishing industry. And while the prawns I buy from supermarkets are only ever the ones that say 'responsibly sourced' on them, what does this really mean? Can I guarantee a sea horse has never died from the prawns I eat? I doubt it. And what really shocked me in reading Eating Animals (though I'm so busy I haven't actually got that far in the book yet, though it's already having an impact) was how much sea life altogether is killed as 'bycatch', for just one piece of fish on your plate. Safran Foer says "Imagine being served a plate of sushi. But this plate also holds all of the animals that were killed for your serving of sushi. The plate might need to be five feet across." And these animals don't just include other fish. In tuna fishing, they include whales, dolphins, sharks, and sea birds of all kinds. Now that's something for me to think about, I reckon. Though not a vegetarian himself, Yotam writes 'The New Vegetarian' column in the Guardian and I bought this book around 6 months ago after reading about it in a magazine. It's been the only recipe collection I've ever carried on using after the novelty of buying the book has worn off, having been so bowled over by the finished results that I just can't wait to try the next thing. I have to admit, it's also been the only cookbook that I've actually taken to bed to read! So excited I was at the fabulous fare it contains. Yotam is from Israel and the cuisine is Middle Eastern influenced, where vegetables are used in far more interesting ways than in the UK, it seems. You will not find a boring array of pasta bakes and 'fake meat' concoctions here. And it's certainly not a book 'just for' vegetarians - committed carnivores will find that the taste sensations in this book are so unique and compelling, that meat will not be missed. Some of the recipes call for unusual ingredients that need to be found at Middle Eastern grocers or ordered online, but they are worth the effort. I have a couple of recipes that I could say were my favourites so far. One is the Aubergine and Lemon Risotto, which is divine, though I'd suggest this makes only enough for three people as a main course. The other is the Mushroom and Herb Polenta (but I must mention, I have done my own variation on this both times I have cooked it, since I did not have the same herbs handy!). Cook from this book and you will be producing top notch, gourmet cuisine in your own kitchen. I promise. Please note that I was vegetarian when I wrote this review, therefore I was not looking at this book on its vegan merits. I just wanted to make a few comments now that I can reflect back, since I am still including this book in my review list for the time being. There a few of recipes in this book that are literally knock-out vegan recipes, and that have become firm favourites of mine. So, it still does come in handy for me as a cookbook. His soba noodles with aubergine and mango recipe is just unbelievable - and this is one I frequently serve at dinner parties (often with the additon of some seitan pieces). There is another which is the Seasonal Vegetable Tempura (no link), that again brings sighs of delight whenever I serve it (though it's a messy one!) and I'm working on creating vegan versions for some of the others I enjoyed in the past. 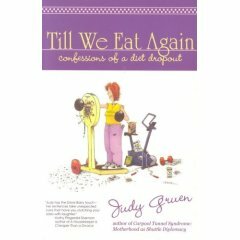 Till we eat again: confessions of a diet drop-out by Judy Gruen is a book review that I should have included here LONG ago. Judy was kind enough to send me a copy of her book maybe a year or so ago, and I've been sitting on it for such a while (well, not literally, else my behind would be quite sore) after reading it. Sometimes, I just don't know what I do with my organisational abilities! However, it is a book that is most definitely worth reviewing, since it made me laugh out hysterically loud on a number of occasions throughout reading. Judy, through biting wit and spot-on self-awareness, depicts her route to losing 15 pounds after she gets invited to a college reunion, and cannot bear the idea of attending carrying the extra rolls. It takes me a while to get into any recipe book, if I ever do. Mostly, I make one or two culinary concoctions and then it sits in my cupboard getting dusty (with a few coffee stains for a well-worn look). However, I recently received The Big Book of Juices and Smoothies: 365 natural blends for health and vitality every day by Natalie Savona, and it is so easy to use, it even draws in a one-pan wonder woman like me. It’s an idiot’s guide, really. And what I most love about the book is that it is coded by cute little pictures of the main fruit or vegetable ingredient of the drink blend, so if you have an abundance of tomatoes in your fridge, you can go straight to the section and look for tomato recipes. Or not as much as women in the UK or US, that is! French Women Don't Get Fat: The Secret of Eating for Pleasure is Mireille Guiliano's light-hearted look at some of the possible reasons as to why obesity isn't as much of a problem for our female neighbours on the continent (and something I wrote about for handbag.com). There aren't any real secrets, but if you've lost the way through dieting, bingeing, starving or whatever, then it can be a breath of fresh air to read something as common sense as this book.